There has been a dramatic decline of Connecticut’s bat population because of white-nose syndrome, the Department of Energy and Environmental Protection said. “Several species of bats that call Connecticut home have been devastated by white-nose syndrome, so much so that in 2015 three species were listed as endangered on Connecticut’s List of Endangered, Threatened and Special Concern Species,” DEEP said. The species added to the state’s endangered list are the little brown bat, the northern long-eared bat (which is also federally threatened) and the tricolored bat. The disease affects hibernating bats and is caused by a fungus. 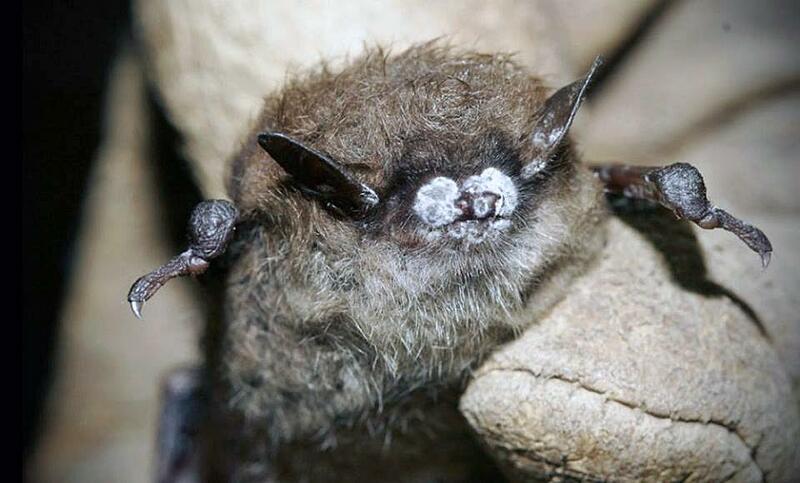 The fungus looks like white fuzz on a bat’s face and grows in cold, dark and damp places. It attacks bare skin while bats hibernate. As it grows, bats become more active and burn up the fat they need to survive the winter. Bats with white-nose syndrome might exhibit strange behavior, including flying outside in the daytime in winter. White-nose syndrome has been found in 33 states in the U.S., including Connecticut, and in seven Canadian provinces. The first widespread signs of white-nose syndrome appeared in caves near Albany, N.Y., in 2007. But photographs from cave explorers in 2006 showed what might have been the first unofficially documented cases of it in North America. The disease was unknown to science until it was discovered in North American bats. It continues to spread rapidly throughout the nation and Canada, mainly through bat-to-bat contact. A map with confirmed locations of the disease can be found at whitenosesyndrome.org/static-page/wns-spread-maps. In some areas of North America, white-nose syndrome has killed 90 to 100 percent of bats; millions of bats across the country have been killed by the disease. The hardest hit species seems to be the northern long-eared bat, the little brown bat and the tricolored bat. Currently, there is no cure for white-nose syndrome. Scientists from across the globe are working to study the disease, how its spreads and infects bats and how to control it. Several experimental treatments, including a vaccine and changing bat habitats, are in progress and are expected to lead to increased survival rates of bats from the disease. Any sightings of bats during the winter should be reported to the Connecticut Wildlife Division to help them monitor white-nose syndrome. More information can be found at https://go.usa.gov/xPmDn. Bats are crucial for healthy ecosystems. Bats provide economic benefits to agriculture and forestry by controlling insects.